Joke’s on me, since I’m pretty sure 2pm will have a nap with my name on it. So I’m sitting here, yawning in economy, 38,000 feet in the air. I’d love to catch some shut-eye now, but I realize I’ve wrecked my routine with an early morning wake-up call, plus two strong, sugary cups of airport coffee. It’s an equation for strung-out, sleepy disaster. The opposite of #goals, if you will. Frankly I should know better, and so should you. But we’ve all been in this snafu, and the next time you know you’re going to jam up your sleep schedule, listen to these armed forces veterans to get the best tips on how to fall asleep anywhere, anytime. 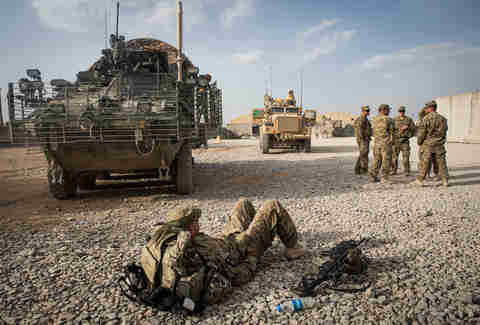 (Perhaps the only thing the military knows better about travel, in fact, is packing.) 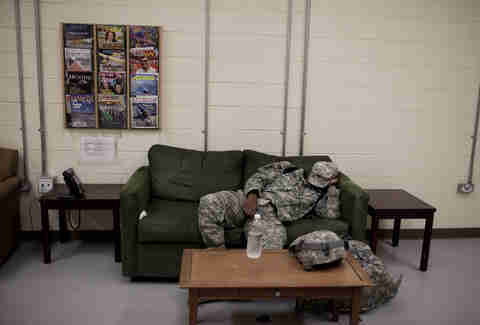 They may be from different branches, but all veterans are special forces when it comes to getting sleep. To ease the mind and body into sleep mode, look into lavender products to help you nod off. “As I was getting out of the Naval Academy and about to become an officer, I was looking up sleep techniques and advice. So I bought lavender spray,” said Ricky Ryba, a former Naval officer and graduate of the US Naval Academy whose CV also includes naps on toilets and in storage rooms. He recommends using lavender spray on your pillows and sheets and carries a travel size with him everywhere. It might sound gimmicky, but the National Sleep Foundation says studies show lavender can lower your blood pressure as well as your heart rate. 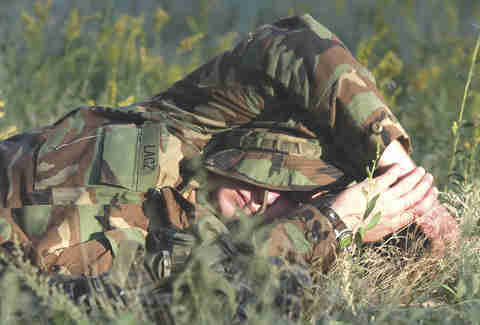 As a member of the armed forces, your heavy gear and armor have some surprising sleep-inducing qualities. Burton recalls a basic training combat exercise that required her and her fellow recruits to hole up in an old hangar wearing an overcoat, gas mask, helmet, and gloves, among other heavy gear. Replicate the comforting embrace of standard-issue armor with a weighted blanket. Doctors say they can help relieve anxiety and relax before bed. Tons of travel versions on the market, meaning you can swaddle up anytime, anywhere. The hands-down, bar none, absolute worst part of international travel is struggling with jet lag. Post-flight naps and wonky bedtimes cut into your valuable vacation hours. You knew they were going to say exercise. Aha, yes, but which one? Despite what Donald Trump says about exercise, it’s standard advice to expend more energy during the day to help tire you out for bedtime. Running is a great way to set your internal travel clock and to tucker you out. But vets swear by another routine. Give bedtime yoga a shot with these eight moves, which can be done virtually anywhere, with no special equipment or mat. Or Google “bedtime yoga,” and you can browse thousands of nighttime routines. Humans have used booze and drugs for centuries as sleep aids. 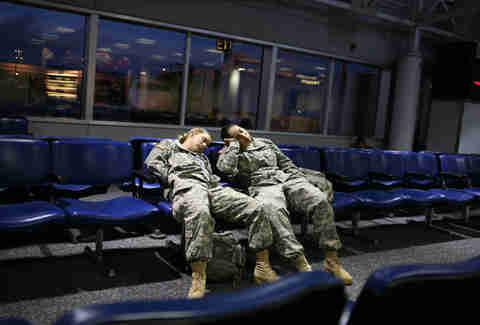 But how beneficial are they for sleeping while traveling? If you’re not above a toke or two, Ryba’s advice is to use a combination of vaping, tinctures, and edibles. “Usually I’ll do a couple of tinctures or drops under my tongue or smoke a little bit of a heavy indica before I go to bed, and I’ll take half of an edible — nothing too strong,” he says. On the flip side, though, don’t count on alcohol to knock you out. The National Sleep Foundation, for one, finds that alcohol consumption before sleep reduces your overall sleep quality. And if you need further convincing, leave it to Feibleman to lay out the facts. “I don’t recommend using alcohol to get to sleep — it makes for really fitful sleep and your brain comes alive as soon as you sober up,” he says. “Going to sleep drunk at 3am and waking up at 7am with a hangover is no fun at all. But it’s worse if you’re about to step into 90% humidity in Vietnam.” Like you, the traveler, soldiers needs to get the most out of their waking hours, too.